Where to begin, let's start with the quickstep variation. It was very much so anticlimactic. They've built this quickstep variation suspense prior to this arc even beginning, and when I finally saw it, I felt like the routine was a dud. Like what was was so special about this quickstep that Sengoku prepared? Child, I don't know. And to pile onto that Tatara flopped during the quickstep variation... the momentum of Mako and Tatara's variation fell after that from my view. After the final heat was over they wrap up the Tenpei cup with handing out the awards. I was so salty that Gaju, and Shizuku won first place, but rightfully so that they took first place since they had everyone's eyeballs glued onto them with every heat. Much to the surprise of those watching this episode (I'm assuming), but not to me, was Tatara and Mako coming in last. Realistically that's where they should be placed in since Tatara's the least experienced, and both of them barely made it past each cut. 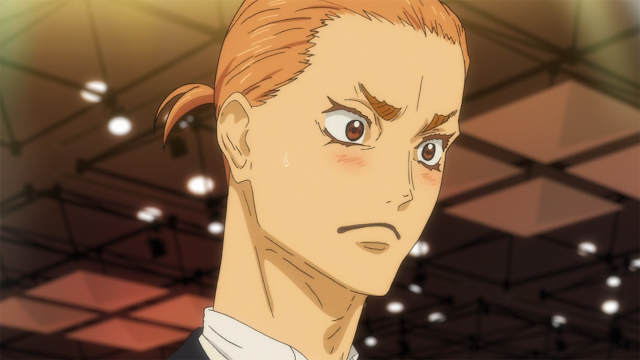 Though there was a small part of me that wanted Tatara and Mako to win first place, just to shove it in Gaju's face. 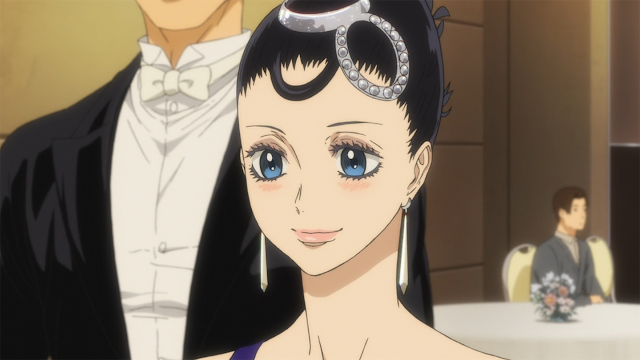 Although that didn't happen Mako was able to snag that Ballroom Queen award away from Shizuku. 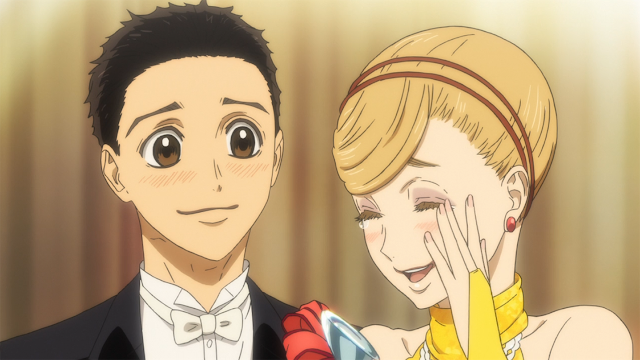 I was pretty happy since Tatara and Mako's solo waltz was my favourite dance routine so far in the anime. Not a surprise that Mako won, since Tatara did a great job at highlighting Mako during the solos. It must haven been a shot to Shizuku's pride (as she was weeping in the bathroom) not winning that award since she was underestimating Tatara and his talents. If I remember correctly Gaju and Tatara betted if Mako won in the Tenpei cup he would separate from Shizuku and pair back up with his sister. So my heart sank when Mako actually decided to go back to that dog named Gaju after the Tenpei cup was over. Girl.. you could have stayed with Tatara. I mean sure, Mako's a changed person after pairing up with Tatara, she's more verbally expressive to what she requires from her dance partner, but as a Mako and Tatara stan it didn't feel good to see them no longer as dancing partners...LOL. 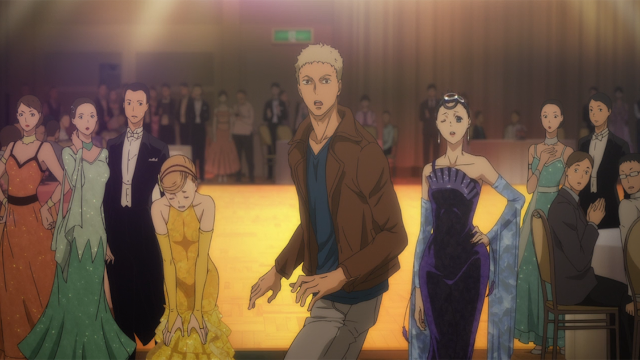 I just hope this is not that last we see of Tatara and Mako as a dance couple. So what's going to happen with Shizuku and Tatara now that they're partnerless? We'll just have to find out with the next few episodes. The girl that was teased at the end is obviously going to be Tatara's new dance partner, and somewhere down the line Hyoudou's going to make a comeback and pair backup with Shizuku is what I'm thinking. Just hoping that the next few episodes will show a good balance of their high school lives, and their dance activities!